You are probably all finished with your holiday cookie exchanges- I know I am. But one of my favorite Christmas time treats is also the simplest to make, and it looks so impressive when wrapped in a pretty box! 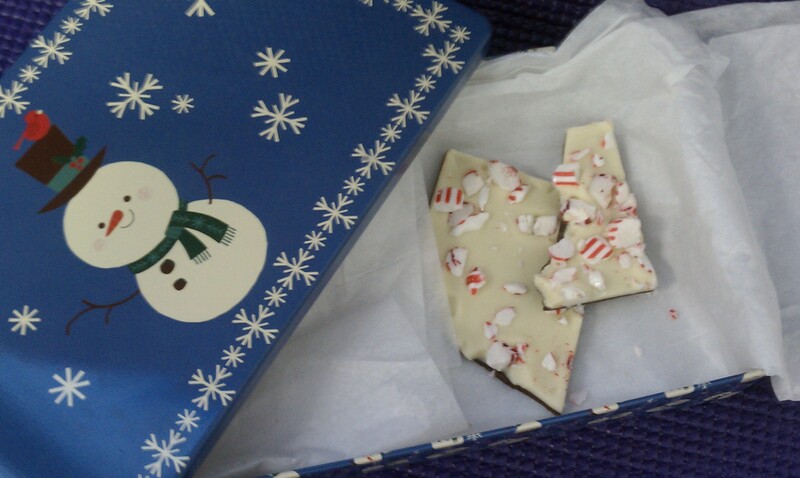 So if you are like me and want to give the oven a rest for a few days, try this beautiful and scrumptious peppermint holiday bark. About 1 cup of crushed up candy canes, any color you like. In a heatproof bowl, microwave the milk chocolate with the coconut oil until smooth and melty. Pour onto the prepared cookie sheet and refrigerate until very firm. 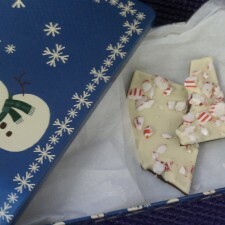 Do the same with the white chocolate, pouring it onto the layer of milk chocolate. Before the chocolate hardens, sprinkle candy canes all over. Refrigerate until firm. When you are ready to serve or box it up, break apart the bark and you are good to go! I LOVE it. Bark is one of the best parts of the holiday season. Thanks for stopping by my blog. Thanks Dara! This one is so simple and so delicious. Thanks for stopping by our blog too.